Everyone gets in a pinch for breakfast from time to time, so we make the “logical” decision to head out the door with no breakfast or smashing down our latest favorite protein bar. I present the alternative, overnight oats. They take less than 5 minutes to make (the day/night before) and can easily travel with you wherever you have to go. The best part about Overnight Oats is that the possibilities are endless, the base recipe (Oats, yogurt, milk) can have endless flavors added to it to create any flavor combinations you want. 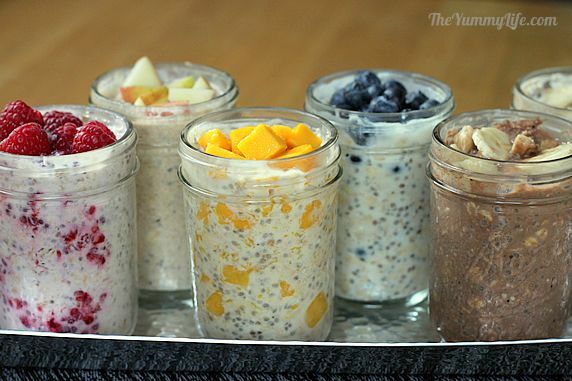 I will include two of my favorite Overnight Oat recipes at the bottom. 1. Poor 1/2 cup of rolled oats (steel-cut oats work as well, just not quite as good) into a mason jar or any seal-able container. This is our basic foundation for this new breakfast, all that’s left is to sweeten it however you would like. Your options range from fruits, to nuts, to protein powder, to syrups, even to bacon… Endless possibilities. 7. Grab a spoon and enjoy the next morning, no need to warm them up, eat it fresh out of the fridge, on your way to work, whatever fits your schedule the best!! Toss in the fridge overnight and walla! !